For many tourists and non-locals, shopping in Milan mostly takes place between Montenapoleone, Corso Vittorio Emanuele, Corso Buenos Aires, not to forget Corso Vercelli. Good for well-known luxury brands, but nothing really particular or uniquely Milanese. Fortunately, there is still the typical Italian culture of small shops with a very special offering. One of them is Salvatore + Marie, a little gem of artisanal craft work in the Naviglio neighborhood, close to Vico dei Lavandai. The place is run by two designers, Salvatore from Sardinia and Marie from Ireland, marrying the best elements of Italian craftsmanship and Nordic reduced pureness and simplicity. 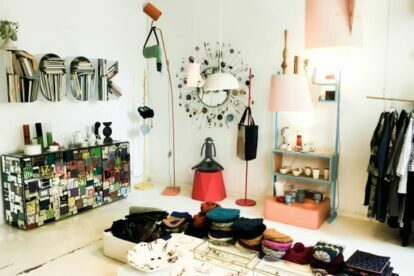 Everybody looking for something really special ranging from tableware to fashion design, from little furniture objects and lamps to hand-knitted plushy toys will love this little shopping gem. Regardless, whether I’m searching for a beautiful birthday present or something little for myself, I have rarely left the place without having taken something home. Even if you do not find the thing you have been thinking of, there will always be a little object without which you cannot leave. Everything on offer is designed by the two owners and manufactured in auto-production or in collaboration with specialized little workshops from all around Italy, upholding the great Italian artisanal tradition and bringing it into the 21st century. Definitely not to be missed!